Absolutely beautiful! 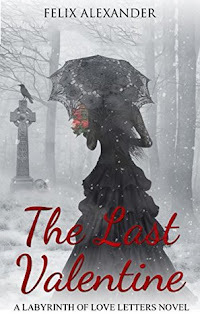 If you love the novels of some of the great romance and intrigue writers of all time, then you will love The Last Valentine. It is similar to those of Gabriel Garcia Marquez and Isabella Allende. It is a combination of genres including romance, historical, and mystery. It is a great read for women, and not your more shallow chick lit read. This one stands alone unique, entrancing, full and rich. It is a cocktail of mystery and intrigue filled with longing and hope. The Last Valentine is all about romance and beauty. It captures the essence of love in all it’s forms. There are many endearing love stories gently woven within the story. It is written in a passionate poetic voice that keeps readers engaged and delighted. The author Felix Alexander expresses his emotions in a very imaginative and beautiful way. The many characters are brilliantly written within the story, Many having interesting eccentric personalities and which all have an important place in the end. Along with the beauty that pleases the aesthetic senses, there is a wealth of local historical knowledge expertly penned within the storyline, making it especially interesting. The book is set in the enchanting land of Puerto Rico. The author depicts the region as a captivating beautiful land with scenes of beauty, interest and culture. Felix Alexander’s descriptions of the sights and places are so well written, defined and poetic that readers feel they are there seeing and experiencing what the characters in the book felt and saw. He puts readers directly in the setting with his exuberant sensual descriptions throughout. The author causes the reader to long to go back in time and visit the places, people and culture in The Last Valentine. The Last Valentine by Felix Alexander is a must read for all romance, historical and mystery lovers. It is a fulfilling short read. It a sensory poetic feast and a great escape from our more ordinary lives.